We are so honored and moved by Jackson’s words, we just had to share them with you. Keep soaring, Jackson! As a child growing up in a privileged community, my sense of the scope of the world was somewhat limited. Until my mother started working for an international education non-profit which builds schools in the developing world, I took for granted many of the opportunities that were granted to me; a full education, and security in terms of safety, positive relationships, and finances. My mother works for an organization called Pencils of Promise (PoP) and she created an SEL curriculum for PoP schools in Ghana. In the process of doing this, she met Bridget Laird, the CEO of WINGS for Kids. Bridget invited us to come and see WINGS in action, so one day, my mom took my brothers and me to Chicora Elementary. Chicora was special because, although the children had mostly grown up in very harsh conditions and some did not have stable environments in which to live, there was an energy of pure joy and unity in the building as soon as we walked in, not only between the kids there but also between the teachers and volunteers. I learned that WINGS was placed in schools which scored a 96.11 out of 100 on the poverty index of South Carolina, putting them in the bottom 10% of all in-state schools. Inspired by the energy present on my visit to a WINGS campus, when it came time to choose my community service activity for high school, I decided to invest myself in something that would be truly meaningful to me. I began to visit North Charleston Elementary twice a week, on Tuesday and Thursday afternoons, last October. Although I was initially part of a program called Soccer Shots which involved teaching kindergarteners and first graders how to play soccer, I was soon getting involved in teaching kids and helping with their academic subjects. 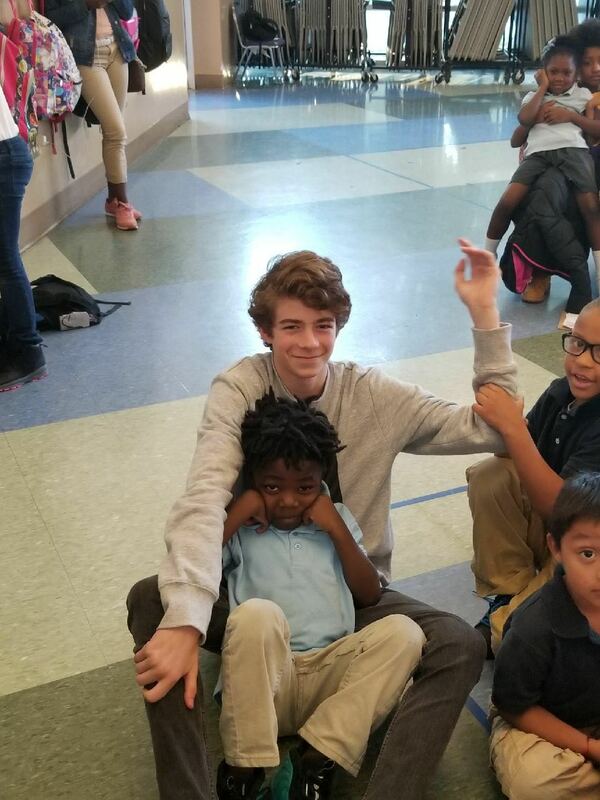 I really got to know these kids from helping them with homework or reading them stories and making them laugh, and immediately felt a bond with them. I realized that we were opposites on a spectrum, and yet, despite their situation, they were strong, unique, and hopeful for the future, as well as full of personality. This helped me to realize that, deep down, we are all the same, which is why everyone, including these kids, deserve the opportunities that a person like myself is born having. Yet over 12 million kids in the US alone live in a state of poverty, and many of them will never get to see these opportunities—like learning how to play soccer, or learning how to draw using stippling–simply because no one cares enough to give them the push they need to make them fly. I made the connection that I did with WINGS because it opened my eyes to communities in poverty, all around the world and right next to me, which need our help in order to be granted the same choices in life that I previously took for granted. WINGS has helped me to see the importance of my role in my community. To see the smiles on those kids’ faces when I walked into the room, to have a boy in kindergarten named Seychaun who held my hand for an entire day while we were presenting our soccer skills to everyone else in the program, to be greeted by a collective shout of “Mr. Jackson!” when I first arrived in the classroom—these were little ways in which I could make these kids happy, and in which I could be a role model to them. Ultimately this made me feel that what I was doing in my small contribution of 40 hours was well worth every second, both to them and to me.